Ed Balls announces that, if Labour wins the next election, he will reintroduce a 50p top tax rate (reduced to 45p by Osborne). Assorted captains of industry say that this would be disastrous for the UK economy. And I remembered a recent post by Justin Fox about why “We Can’t Afford to Leave Inequality to the Economists”. While I would not object to his point that inequality involves political and moral issues as well as economic ones, I think he misses a key point. We need economists to provide a narrative of why the pay of the top 1% has surged ahead in the US and UK since the 1980s, a narrative to counter the claims from the 1% themselves that it just represents the market rewarding skill and productivity. This post talks about one narrative that I think has great power, and also has important implications for that top tax rate. This narrative matters because change has to be mediated through politics. Janan Ganesh in the FT says that although restoring the 50p rate in itself is popular in the UK, in the end voters may be more swayed by business leaders saying it (or a Labour victory more generally) will damage the economy. As I have noted before, Labour under Blair, Brown and to an extent Balls went out of their way to be business friendly and woo the business sector, because they thought this was essential to electoral success. (Robert Peston, who is a better position to know, agrees.) Most of the reasons why they thought this have not gone away. There is a widespread belief that there is too much inequality in the UK and US, while at the same time the public underestimate the degree of inequality that actually exists. Yet arguably elections get won or lost on who the electorate believes is competent to ‘manage’ the economy. If political parties that aim to do something about growing inequality also appear not to enjoy ‘the confidence of business’, then they may not get elected. We need people who have some knowledge and objectivity about the economy and markets to argue that those that speak for business are actually just speaking for their own personal interests. So what is the alternative story to the argument that executive pay reflects the market rewarding the rising productivity of CEOs? The first obvious point is that executive pay is not determined in anything that approximates an idealised market where prices are set to balance supply and demand. Instead it is set within a bargaining framework between employer (the firm) and employee (the CEO). Even if we imagine the employer in this case to be someone that genuinely reflects the interests of shareholders, the costs associated with losing your CEO, together with informational problems in assessing their true worth (which can lead to the age old problem of judging quality by price, and the ‘arms race’ that Chris describes), mean that the CEO potentially has substantial bargaining power. Yet this situation did not suddenly arise in the 1980s, and it will be true in most countries, and not just in the US and UK. So why did executive pay start taking off in the 1980s in these two countries? Well something else happened at the same time: tax rates on top incomes were also substantially reduced. Why does reducing the tax rate on top incomes lead to a rise in those incomes pre tax? With lower tax rates, the CEO has a much greater incentive to put lots of effort into the bargaining process with the company. They, rather than the tax man, will receive the rewards from being successful. The compensation bargaining model has a clear policy implication. The problem with lowering the top rate of income tax is that it encourages the executive class to engage in efforts to raise their pay at the expense of everyone else. We need a high top rate of tax to discourage this, even if this rate might not actually bring in more income. Perhaps most importantly, it provides a plausible alternative to the market rewarding effort narrative that is so frequently used, and it also has the advantage of being closer to the evidence. For an analogy, think about central bank independence. There are many reasons why you might be concerned about politicians being able to set interest rates, and why control by independent central banks is preferable. Macroeconomics settled on one particular idea, that of time inconsistency and inflation bias. Was it because all economists thought this was really the most important problem. I suspect for some at least it became a proxy for rather more general, but therefore vaguer, stories. Technically, the tax rate is raised above the conventional optimum by an amount that represents a Pigouvian correction to the rent-seeking externality. Following this post, James Bullard (President of the St. Louis Fed, and member of the FOMC - the US equivalent of the Monetary Policy Committee) kindly sent me his article (pdf) entitled ‘Death of a Theory’. As the theory he is referring to is the idea of fiscal stimulus at the Zero Lower Bound (ZLB), the title tells you that the article comes to the opposite conclusion to my post. His article is clearly written, and works with the New Keynesian framework which I also use. So we do not need to worry about those who practice the demand denial that Paul Krugman talks about here. I also think the article reflects the views of many economists. For these reasons, I thought it would be useful to say why I disagree with it. (iii) governments pushed distortionary taxes into the future, which in the theory reduces or eliminates the desired effects. Let me take each in reverse order. The standard textbook countercyclical fiscal policy involves increasing government spending now, and financing this by raising taxes once the recession is over. I have argued before that this framing is unfortunate, because it is unnecessarily complex. We need to worry about the impact of future distortionary taxes on future output, and then compare these to the output gains during the recession. Instead I have argued that we should focus on what I call a ‘pure’ countercyclical increase in government spending, where the additional current spending today is financed by reduced spending (not higher taxes) in the future. Bringing forward public investment is the exemplar of such a policy, which is perhaps one reason why it commands such widespread support. So criticism (iii) is specific to one particular form of countercyclical fiscal policy. Point (ii) is generic. However we need to be careful about what is being claimed here. Does ‘quite effective’ mean has some effect, or does it mean as effective as conventional policy? I agree with the former, but not the latter. Nor do not think Bullard tries to claim the latter. Yet the latter is what you need if you want to assert that fiscal policy is unnecessary, because fiscal policy is unnecessary only when it is dominated by monetary action. By dominated I mean that monetary policy can do everything that fiscal policy can do, but with more certainty and at less cost. I know of no reason why this should be true for unconventional monetary policy. As an example, in the Werning paper I discussed here, forward commitment monetary policy works best when it works with changes in government spending - it does not make fiscal action unnecessary. I do not agree with (a). I suspect the only people who believe (b) are central bankers. I find the first of Bullard’s criticisms the most perplexing. There is a perfectly sensible argument which says that for fine tuning demand, monetary policy is more flexible than fiscal policy. I have no problem with this. However what we are talking about today is a very large and prolonged recession. The fiscal actions that are required are not fine tuning. Furthermore, in both the US and the UK we had in 2009 governments acting to implement countercyclical fiscal policies, and by most accounts these did indeed stimulate demand, although not by enough to end the recession. Now perhaps ‘ill-suited’ is code for ‘many politicians dislike this policy’. But if it is, then you do not talk about the ‘death of a theory’, but instead you discuss the political problems of implementing a theory. To see why this distinction is so important, consider what has happened since 2010. We have had cuts in government spending in varying degrees across countries, and where the cuts have been largest, the recession has been more severe. That is the ‘dying theory’ working, and politicians for whatever reason choosing to go against it. What worries me about the ‘monetary policy is still all you need’ line is that (to put it most politely) it encourages these misguided policy actions. That is not good for most people in the economy, but it also does monetary policymakers no good either, because they promise too much. I have a personal form of forward guidance: that I try and wait a day between writing and publishing blog posts. So yesterday I wrote a post reacting to the previous day’s news that UK unemployment had fallen rapidly to 7.1%. That news led to some speculation that the Monetary Policy Committee (MPC) of the Bank of England might change the number for their unemployment ‘knockout’ (the point at which they might start thinking about raising rates) from 7% to, say, 6.5%. There has been similar speculation about US monetary policy. I wrote that I thought this would be unlikely, but rather than let guidance wither away, they would instead prefer to change the nature of their guidance. So today, as that post laid waiting on my hard drive, I read that Governor Carney indicated that the Bank has decided not to revise its 7 per cent unemployment threshold. “We’re trying to get across that it’s all about overall conditions in the labour market . . . We wouldn’t want to detract from that focus by unnecessarily focusing on one indicator.” So I’ve lost my opportunity of showing that I can anticipate MPC thinking. Perhaps instead I can write about why they might be thinking this way, and what they might specifically do. The place to start is with why unemployment has been falling much faster than expected. As Chris Dillow explains, it indicates that UK productivity continues not to grow. The Bank hoped that the return of output growth might be accompanied by a resumption in productivity growth, so that unemployment would come down more slowly. They can hardly be blamed for this. Zero productivity growth for four years during a recession was puzzling, but continuing flat productivity when there is a recovery in output growth is in macroeconomic terms just weird. So how might forward guidance change? Here we need to make one point, and then ask one question. The point is that forward guidance is all about providing information to the public about what policy might do if events deviate from forecasts. As a result, those critics of such guidance who use poor forecasting as an argument completely miss the point. It is not what I call forward commitment. This leads us to the question: what is it that makes the MPC relaxed about the unexpectedly rapid fall in unemployment? The answer is in this chart, which shows year on year growth in private sector earnings (source:ONS). With earnings growth at 1%, and productivity flat, that means unit labour costs are rising well below the inflation target of 2%. If earnings growth stays at 1%, there is no reason coming from the labour market for raising interest rates. If private sector earnings do start increasing by more than 2%, then the focus will then shift to productivity growth. Only if this fails to match the increase in earnings will a rise in rates become a distinct possibility. So the natural way to change forward guidance is to incorporate this thinking. The unemployment knockout could be replaced with one that says interest rates increases will not be considered as long as private sector earnings growth is not more than 2% above private sector productivity growth. And now I think I should post this, to avoid another rewrite. Everyone has heard of neoliberalism, but not many outside Germany have heard of Ordoliberalism. I’m hardly an expert on either, and in particular I know very little about the particular thinkers involved and the many varieties of each concept. However as an economist it seems to me that ordoliberalism is much closer to economics than neoliberalism. The clear difference between the two ideologies involves the role of the state. Neoliberalism wants to minimise the role of government, and in particular is naturally against all forms of state interference in markets. Its attitude to markets is essentially laissez-faire: leave market participants alone. In contrast Ordoliberalism sees a vital role for the state, in ensuring that markets stay close to some notion of an ideal market. In particular, ordoliberals believe that without a strong government powerful private interests would undermine competition. This view is often credited with inspiring strong competition laws in Germany, and perhaps also in the European Union (see this paper by Gerhard Schnyder and Mathias Siems). In this respect, Ed Miliband’s proposals for UK banking discussed by Chris Dillow are rather ordoliberal. Ordoliberalism therefore seems much closer to the attitude an economist would naturally take. There is a clear sense in which perfect competition is an ideal in certain situations, but no clear reason why this ideal should obtain naturally. There are plenty of reasons why imperfect competition may persist, and only a few may be the consequence of government ‘interference’. There is therefore an obvious role for government to counteract anti-competitive behaviour by ‘big business’. From this economics perspective (with apologies to John Kay), there is no reason to limit the role of the state to preventing anti-competitive behaviour. There are many other market imperfections that can be eliminated or reduced through government action. For example externalities can be tackled using particular types of taxation. The very use of the term ‘market imperfection’ seems to match the ordoliberal perspective. Whether this broader view of market failure and a role for state intervention is taken on board in ordoliberal thought is less clear. This is rather important for reasons that I’ll come to. Once you see the state as necessary to achieve a market ideal, you need to worry about how you get the right sort of state. Ordoliberal thought sees the same danger of vested interests subverting the ‘proper’ functioning of the state just as they see in big business subverting perfect competition. There seems to be limited faith in democracy ensuring this does not happen (perhaps for obvious historical reasons), and instead a focus on rules and independent institutions. This would include, for example, an independent central bank: again there are parallels with current economic ideas. You can perhaps also see this focus on rules in the Eurozone’s fiscal compact. There are of course many respects in which ordoliberal and neoliberal views are similar. One is an antagonism to Keynesian ideas, as I have noted before. Yet even here I think there is a potential difference. The neoliberal rejection of Keynesian demand management, even at the zero lower bound (or within a monetary union), is straightforward - it is a form of government intervention in the market. However it is less clear whether the rather limited Keynesian policies advocated by New Keynesians have to be incompatible with basic ordoliberal ideology. If you see the friction generated by sticky prices as something that generates externalities, then you can see a role for the state in limiting the impact of these externalities. Most of the time (or at the level of the monetary union), this intervention could be handled by monetary policy, but at the zero lower bound or within a monetary union countercyclical fiscal policy could play a role. In other words, while it is clear to me why a neoliberal would be anti-Keynesian, it is not so clear why an Ordoliberal has to be. So to summarise, I think any economist - if they are open minded - can see the problems with neoliberalism. You might say that neoliberalism borrows from economics only in the sense that astrology borrows from astronomy. Ordoliberalism, because it admits the possibility of market imperfections and a role for the state in correcting them, seems - to adapt a phrase from Margaret Thatcher - more like an ideology that economists can do business with. Will the financial crisis lead to another revolution in macroeconomics? This question was prompted both by an earlier post, and by reading Martin Wolf’s excellent 2013 Wincott Memorial lecture. (The response by Robert Skidelsky is also worth reading.) In the lecture he in characteristic style tries to demolish the idea that we have permanently lost a large amount of productive potential, and also argues that we need to fundamentally rethink the role of the financial sector. Bravo to that. He also says that the financial crisis “calls for an intellectual upheaval reminiscent of the response to depression in 1930s and then to inflation in the 1970s.” It is this last idea that I want to explore here. That the depression led to Keynesian economics, and that this revolutionised macroeconomics, cannot be disputed. If the great inflation of the 1970s did a similar thing, then we might indeed expect something similar to follow from the financial crisis of 2007-9. Yet it is far from clear to me that it did. It greatly increased, for a while, the popularity of monetarism, but in theoretical terms that was hardly revolutionary (it used IS-LM), and its popularity died out pretty quickly. The adoption of monetary policy as the stabilisation tool of choice owed something to monetarism, but it probably owed much more to the move to flexible exchange rates when Bretton Woods collapsed. Friedman’s reinterpretation of the Phillips curve was important, but it was not revolutionary. There was a revolution in macroeconomics in the 1970s and 1980s, but it was a counter revolution, as the name New Classical implies. It was essentially a revolution inspired by theory (rational expectations, and microfoundations more generally), rather than external events. 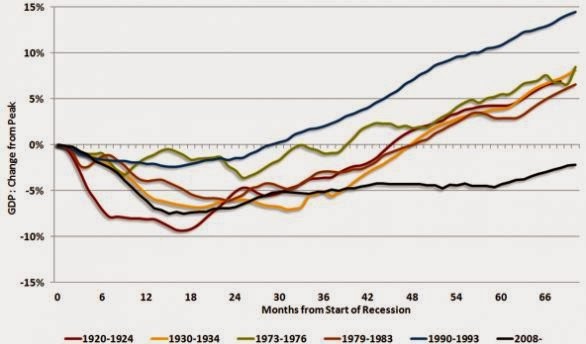 There is no obvious link with the great inflation of the 1970s. Indeed, the RBC model that embodied most of the ideas of that revolution had essentially nothing to say about inflation. So, in this straightforward sense, the great inflation of the 1970s did not lead to a revolution in macroeconomic thought. This suggests that there is no inevitability that the financial crisis will lead to any revolution in macroeconomics. Everyone admits that mainstream macro analysis took finance for granted before the crash, and those economists that did worry about such things were marginalised. (I would want to add Greenwald and Stiglitz to the usual list.) But now ‘financial frictions modelling’ is the growth area within the discipline. However this explosion of work does not appear revolutionary, but just another example of adding particular ‘frictions’ or ‘market imperfections’ to standard models. As yet there is no sign that the financial crisis is about to lead to any paradigm shift in macro, even if some might wish it so. I can think of three ways the reaction to the financial crisis could lead to major evolutionary changes over time. First, it may end the tyranny of the consumption Euler equation, and finally give agent’s asset positions the key role they deserve in understanding their behaviour. (See this earlier post of mine, or this more recently from Noah.) Second, the need to incorporate financial frictions, and other balance sheet effects for households and firms, while retaining the many essential features of the macroeconomy (e.g. labour market search, sticky prices) may require (for tractability) a gradual softening of the microfoundations methodology. I doubt that this will involve any sudden change, but just the increasing use of tricks like Calvo contracts that allow modellers to use aggregate equations that work empirically. Third, and most speculatively, I suspect we will see real attempts to model in a behavioural way changing attitudes to risk. So, just as the great inflation of the 1970s in itself led to an evolution rather than a revolution in macro, we might see something similar following the Great Recession. However, to be a little controversial, perhaps there is a more indirect link between the great inflation and the New Classical revolution, which involves ideology. I think you could argue that the events of the 1970s led to an intellectual revolution in the sense of promoting neoliberalism and questioning the value of collective action in the form of both state intervention and trade unionism. That did not require any revolution in economics, because it came from (a selective reading of) the existing economics playbook. However you could argue (in a rather functionalist way) that Keynesian economics was too great a counterexample to the neoliberal view of the world, and therefore had to be overturned. A counterrevolution was required. I’m not sure how important this is, because I still think the main reason New Classical ideas won out against traditional Keynesian theory was that they won the intellectual argument. However I have also learnt in the last few years not to underestimate the role of ideology in economics. If you think this argument has some merit, then you might continue as follows. Although the financial crisis may not have exposed fundamental flaws in macroeconomics (just fundamental gaps), it should have exposed the failure of neoliberalism as an ideology. Finance was the poster boy of neoliberalism, where unfettered rewards and deregulation would generate innovation that helped fuel economic growth. The financial crisis led to the complete collapse of that story, with the whole sector having to be rescued by the state, and causing a prolonged recession. Yet the growing rewards continue regardless. It is now clear that these excessive rewards come not from innovative dynamism but either from rent seeking, or from risk taking supported by an implicit state subsidy (pdf). While the political forces that benefited from neoliberalism are strong, the bankruptcy of that ideology, and the harm done by the inequality it generated, are too great a truth to be resisted for long. If that turns out to be true, then there may be some implications for macro. Theories that find support not from evidence but from the neoliberal positions they help justify may begin to be seen as the unacceptable face of the discipline. Conformity with most rather than just some of the evidence may start to matter more than conformity with a simple microeconomics that idealises the market. But this sounds too much like wishful thinking, so I suspect there is something wrong with the argument! In a recent post I wondered whether, in 20 years time, we might look back on this period with the same bewilderment that we now look back on monetary policy in the early 1930s or 1970s. After the 1929 crash the Federal Reserve was relatively slow to cut interest rates, and Milton Friedman argued the Fed was largely to blame for the subsequent depression. In the 1970s central banks failed to raise interest rates in response to rising inflation. As my previous post was ‘for economists’, let me spell out what central banks may be missing this time. As we all know, short term nominal interest rates in the US, UK, Eurozone and Japan are as low as they can go, so it appears as if there is nothing more central banks can do with conventional interest rate policy. However that is not the case. What they can do is promise to keep future interest rates lower than they would otherwise be. This policy, first suggested by Paul Krugman for Japan and championed by the highly influential Michael Woodford, I will call ‘forward commitment’. It is not the same as ‘forward guidance’, which central banks are implementing. The form of forward guidance that the US and UK operate involves giving the public some information about when interest rates might begin to rise. For example, if unemployment falls below some figure, each central bank may think about raising rates, but there is no commitment to do so. I believe the best way to understand this policy is that it is entirely conventional, targeting a combination of expected inflation and the output gap, but that it gives the public a bit more information about the trade off between these two goals. The forward commitment policy is radically different. It promises to allow both inflation and the output gap to be above target in the future, so as to increase demand today. How does this work? Perhaps the easiest way to think about this is by considering long term interest rates. Long term (say 5 year) interest rates are mainly a combination of expected short rates from now until 5 years ahead. If you promise to have above target inflation tomorrow, the central bank must allow future short term interest rates to be lower tomorrow, which reduces long term rates today. Lower long term interest rates encourage additional consumption and investment today. I call this the forward commitment policy because the central bank has to make the private sector believe it will carry it out. The problem is that the policy has a built in temptation for the central bank to cheat. They increase demand today by making the promise to allow inflation to be above target tomorrow, but once tomorrow comes they can change their mind - because who likes above target inflation? Yet if the private sector believes they will change their mind, the policy will not work today. So the central bank has to commit to allow inflation to be above target in the future, and get the private sector to believe in that commitment. There are various ways it could do this. One is to have a target path for the level of nominal income (nominal GDP). The recession reduces nominal income, so nominal income has to grow more rapidly to catch up with its target path. That may well involve inflation rising above 2% for a prolonged period. You might wonder whether this policy just helps one problem (lack of demand in the recession) by creating another - above target inflation after the recession is over. That is true, but if the recession is deep enough the net result is still positive on balance. However what is also true is that the policy is best implemented at the beginning of the recession. Once the recovery is underway, and the period at which nominal interest rates would normally be stuck at zero decreases, the net benefits of implementing the forward commitment policy decline. Some people have interpreted forward guidance as forward commitment, because forward guidance in the UK and US allows inflation to go slightly above target if unemployment remains high. I think that is a mistake. Traditional inflation targeting allows inflation to go above target if unemployment is high (as we have seen in the UK and US). The distinctive feature of forward commitment is a promise to allow inflation to be above target when unemployment is low (or equivalently the output gap is positive, rather than negative as it is at present). No central bank has made this promise. So what we may ask in 20 years time is why central banks did not try this forward commitment policy. In simple toy models, as my previous post showed (where conventional policy is called ‘discretionary’), it can lead to much better outcomes. Is it too late? In the US, with the recovery well under way, I suspect it is. In the UK, where we seem to have got very excited by the economy actually growing again, the same is probably (if regretfully) true. However the story might be very different in the Eurozone. The Eurozone experienced a real double dip recession. Although positive growth has recently resumed, the OECD still expect the output gap to be -3.5% in 2015: much higher than they forecast for the US or UK. Inflation is currently below 1%, and my colleague Andrea Ferrero argues that there is a real risk of deflation. So the case for a forward commitment policy in the Eurozone remains strong. Furthermore, the ECB feels it cannot implement a Quantitative Easing programme of the type followed by the UK and US, so it may be more inclined to try forward commitment. But, you may rightly say, isn’t the ECB also notoriously conservative? In particular, German central bankers and their allies would never allow a promise of above target inflation. I suspect this is right, but let me offer a glimmer of hope. Forward commitment could be sold not as a radical new policy, but a return to a very old one: money targeting. The one major central bank that did maintain a money targeting policy for more than a few years was the Bundesbank. Why is money targeting like a forward commitment policy? Because the level of the money stock is closely related to the level of nominal income. So having a target path for the stock of money is like having a target path for nominal income. And as I suggested above, having a target for nominal income is one way of implementing a forward commitment policy. So if I was ever in the position of advising the ECB (!) I would sell forward commitment this way. I suspect it would not work, partly because the Bundesbank in practice never rigidly targeted the level of the money supply. However I could reasonably argue that the inflation performance of the German economy in the 1970s was better than in the UK or US partly because expectations were anchored through money supply targeting. It would be worth a try. Was the UK government’s use of North Sea Oil a scandal? Aditya Chakrabortty of the Guardian thinks so, as do many on the left. The evidence appears at first sight quite strong, if we compare the UK to Norway. The Norwegian government invested the proceeds from its share of North Sea oil in a sovereign wealth fund, and as a result each Norwegian citizen is currently about $150,000 richer. The fund holds on average 1% of the world's shares. In contrast, there is no equivalent UK sovereign wealth fund, but just a lot of UK government debt. QED? Not so fast. The opposing argument can also be stated in an equally compelling way. Why should the government decide on what to do with the oil revenue? The democratic thing to do with the money is to give it to the people, and they can decide what to do with it. To the extent that they choose to invest it, so the argument goes, individuals are much better at making good investment decisions with their own money than the government is. Seen this way, the complaints from the left are just another example of the paternalistic belief that the state knows better what is good for people than people themselves. What Mrs Thatcher’s government did was allow individuals to create their own wealth from North Sea Oil revenues, if they so wished. There are essentially two issues here: one involving distribution between generations, and the other distribution between individuals. Few would argue that the generation who paid taxes in the 1980s deserved exclusive rights to the benefits of North Sea Oil: most would agree that this resource should also benefit future UK generations. Now the current generation could look after future generations by investing rather than consuming a large part of the revenues. The standard macroeconomic model assumes this happens to some extent (agents care about their children etc), although in a way that heavily discounts the welfare of future generations. Did they do this? So was the UK government’s policy a scandal? One definition of scandal is “an action or event regarded as morally or legally wrong and causing general public outrage”. Well, general public outrage it did not cause: giving the majority of people at least some money rarely does, and that those who were better off got most was a feature of the decade. On the other hand the fact that so little of the wealth was left for future generations, in contrast to the ‘statist’ Norwegian alternative, does seem to pose serious problems for neoliberalism, as well as the core intertemporal macroeconomic model. Will the MPC raise UK interest rates in 2014? Chris Giles of the FT thinks they will. His reason is straightforward: economic growth will continue to outstrip productivity growth, implying unemployment will fall below the MPC’s 7% threshold, and the MPC will worry that inflation will start rising. While I try an avoid making forecasts (see my first answer to the FT questionnaire here), I would agree that strong growth in 2014 is more than possible. The savings ratio could continue to fall, net trade could pick up and non-residential investment may begin to recover. It would be bad news if this was accompanied by continuing near zero productivity growth, but as we do not know why UK productivity growth has stalled, we cannot rule this out. Yet if interest rates did rise as a result, it would be extraordinary. To see why, just compare the UK with the US. US GDP began growing strongly at the end of 2009. So the UK is a full three years behind. Yet the US still has interest rates at their zero lower bound, four years after their recovery began, and has only just begun to scale back increases in its quantitative easing programme. (The MPC stopped increasing their programme some time ago.) So if we followed the US, there would be no question of raising rates this year. The UK has been unusual in the past because of inflation. While US inflation has been at or below target for the past year and a half, it has been above target in the UK for 4 years. Yet the UK inflation rate is now down to 2.1%, despite the recovery in output. So it increasingly looks like high UK inflation in the past was down to a number of temporary factors, which the MPC rightly ignored. This is consistent with other measures of UK inflation, which have been lower throughout. Now of course if inflation really does look like taking off in 2014, the MPC will raise rates. But what would ‘taking off’ mean precisely. As the MPC focuses on inflation two or so years down the line, I think it would have to mean a sudden tightening in the labour market. Given that unemployment is currently around 7.4%, and averaged 5.25% between 2000 and 2008, and earnings growth is currently running at 0.9% in nominal terms (! ), we seem to have a long way to go before anyone could argue the labour market is about to initiate a wage price spiral. Think of it another way. UK GDP is currently between 15% and 20% below where it would have been if it had followed past trends and there had been no recession. Past trends involved average growth rates of at least 2%. With that historically unprecedented gap, if two years of GDP growth one or two per cent above that past average meant monetary policy had to be tightened, it would mean accepting that something catastrophic and irredeemable had happened to the UK economy. That is why a rate rise this year would be extraordinary. Now you might say a small increase in UK short term interest rates would still mean that monetary policy was easy, but just a little less so, and so a modest rate rise would be no big deal. The Resolution Foundation would strongly disagree. In a recent report they looked at the impact that various different scenarios for interest rates would have on households. The following chart indicates the key point. As a result, even a small increase in interest rates is likely to have a large impact on at least some parts of the UK economy. The Bank is well aware of this (pdf, HT Pieria), so members of the MPC should not take this action lightly. As I have argued before, given the risks and uncertainties associated with the economy’s current position, it makes much more sense to take risks with inflation than to risk stalling the recovery. But I also thought that in 2011, when GDP growth was flat, and a third of the MPC disagreed, so nothing is for sure. We can at least be thankful that interest rate decisions are not made by the so called ‘Shadow MPC’, a group set up by the Institute of Economic Affairs. They have been voting since February 2013 to raise interest rates! How can you vote for higher rates before a recovery starts, when it is obvious that there is large scale involuntary unemployment and underemployment? Well back in the 1940s Michal Kalecki had a theory, but then he was a Polish immigrant! A long time ago, the debate between monetarists and Keynesians was the debate in macro. But it was a rather limited debate: both sides generally used the same model (IS-LM), and so it was all about parameter values. It was also, dare I say, a little dull. More recently, but before the recession, that debate had largely gone away, but since then it seems to have come back. This post asks why that is. Before the recession, what I have called the consensus view was this. Under flexible exchange rates, monetary policy was the instrument of choice for demand stabilisation. Textbooks tend to give you a list of reasons why this is, but as I and colleagues argue here, it follows naturally in a New Keynesian model. It is not because fiscal policy cannot stabilise demand, but because (in fairly simple cases) monetary policy is better at doing so. From a welfare point of view, it dominates. Does that mean, when monetary policy is unconstrained, it is all you ever need in a New Keynesian framework? In theory no. To take just one example, in a model with wage and price stickiness, real wages will deviate from their natural level following shocks, and in principle changes in income taxes or sales taxes could correct this. Even more obviously, these same taxes can in principle offset cost-push shocks. However you might describe this as a niche role for fiscal policy: the basic and fundamentally necessary task of stabilising demand is best handled by changing interest rates. The qualification that monetary policy is unconstrained is critical, of course. If you are a member of a monetary union, it is a completely different game, and now fiscal policy’s ability to influence demand makes it useful, although perhaps not essential. I have argued that a failure to understand this was a major factor behind the Eurozone crisis. The other example of a constrained monetary policy is of course the Zero Lower Bound. At the ZLB we have fiscal policy versus unconventional monetary policy. There are good reasons for thinking that unconventional monetary policy will not dominate fiscal policy as a stabilisation tool. Analysis of one particular unconventional policy, forward commitment (which is not the same as forward guidance), shows fiscal policy is not dominated in this case. So which is better comes down to parameter values and the details of the model used. Given the uncertainties here, the only reasonable approach to take in advising policymakers is to use a combination of both policies. If you are thinking that concerns about debt might rule out using fiscal policy, you are wrong: temporary balanced budget changes in government spending can still be a useful tool. This eclectic approach seems to me to be the one taken by, say, Paul Krugman or Brad DeLong. What I do not understand is why there are others who take a different view, and want to argue that monetary policy is still all you need. Where does this certainty about the powers of unconventional monetary policy come from? As I have already noted, it does not come from the theory that I know. So maybe it comes from a belief about parameter values, but given how untried this policy is, how can you be so certain as to not want to hedge your bets with fiscal action? But perhaps it’s not the effectiveness of unconventional monetary policy that is crucial here, but a profound mistrust concerning the effectiveness of fiscal actions. Yet I cannot see the macroeconomics behind that either. In its purest form, all fiscal stimulus involves is bringing forward public spending, just as monetary easing encourages the private sector to bring forward their spending. That is bound to be effective in combating demand deficiency. Is the fact that the spending takes place this year rather than in five years time that costly, particularly if the spending is investment like in character? So I remain mystified where this desire to downgrade the usefulness of fiscal policy at the ZLB comes from. I suspect I am missing something, and would like to know what that is. Here are two charts that tell their own story. The first comes from this site. 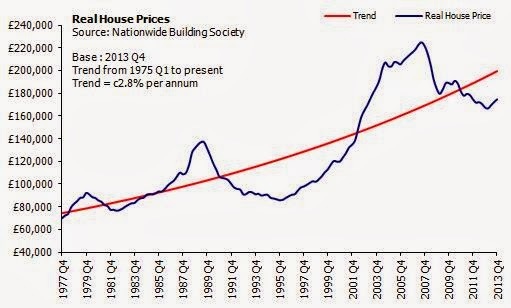 The second shows UK house prices from Nationwide. Cutting back on public investment, and just hoping the private sector will increase their investment to compensate. Does that sound familiar? Cutting back on public investment, and paying for the consequences later. Does that sound familiar? Never mind, just keep repeating 'private sector good, public sector bad', and continue to get your facts from certain newspapers. Just to forestall an inevitable comment, the problem may well have been all those restrictive regulations we call planning, and the largely Conservative voting rural areas that use those regulations to resist new housing. (Or maybe it’s a bit more complicated, as Alex Marsh suggests.) 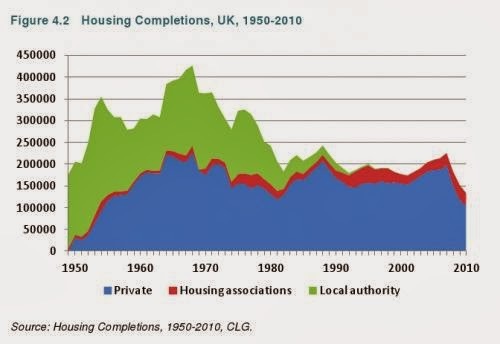 But as every economist knows, if you remove one ‘distortion’ (public house building) while leaving others in place (planning), you can end up worse off, which seems to be what has happened. I have used the following analogy before, but it remains pertinent. Imagine you are an academic scientist who is genuinely sceptical about climate change. I have met them so I know they exist. You are asked by a journalist whether the current spell of cold weather disproves man made global warming. Perhaps you are tempted to say yes, or ‘yes, although’, because it would encourage scepticism. But I’m almost certain you would instead say ‘of course not’. You would then give the journalist a little lecture about probabilities, averages, trends and so forth. It is exactly the same answer that a scientist who believes in climate change would give. You do not give the wrong answer just because it is convenient to your overall argument, because you are an academic and a scientist. You have standards. Now imagine (maybe you do not need to) that you are an economist and you are asked by a journalist “Has George Osborne’s “plan A” [fiscal austerity] been vindicated by the recovery in 2013?” There is only one correct answer to this question - no. It is the correct answer, even if you believe plan A is the right policy. I rather like the analogy that Chris Dillow recently used: “To give Osborne credit for the recovery is like praising a taxi-driver for getting us home when he has taken us on a two-hour detour.” Chris says that the mistake of saying yes is an example of outcome bias. For some maybe, but for a trained economist it is no excuse. I think, like Paul Krugman, that it is just political opportunism. It is important to understand that this has nothing to do with whether Plan A was a good or bad policy. What a supporter of Plan A should reply is “No, but I still believe Plan A is the right policy for the following reasons”. If they are being generous they might even say “the fact that the recovery has been so delayed could be evidence against Plan A”. But for an economist, a recovery four years after the recession is never going to be evidence that supports Plan A.
I’m afraid this is an example of something we have seen before. When some economists enter a political arena (using political in its widest sense), there is a danger that they leave their scientific standards behind. Thankfully only two academics answered yes on this occasion, but many more city economists did so. So I should have been braver in my earlier post about the differences between academic and city economists - an explanation I should have added is that some city economists have lower scientific standards. You could say I am naive to expect anything else. As a great deal of politics is about economics, then economics is also bound to be political, and cannot hope to have the same integrity as a science. There is a weak form of this proposition with which I agree: economic ideas are influenced by ideology, and it is foolish to pretend otherwise. But our reaction should be to expose these influences and try and reduce them, rather than shrugging our shoulders. What I refuse to accept is that economics cannot be an evidence based discipline. So, if the hypothesis is “Plan A is the appropriate policy” and the evidence is “the economy recovered in 2013”, any economist can only give one response: the evidence does not support the hypothesis. Just because the question is political does not justify saying otherwise. In fact, being in a political arena means it is all the more important to maintain scientific standards. That is why we call economics a discipline. I wrote this while listening to a Christmas present, a CD of this (Mercury nominated) album by Jon Hopkins (thanks again Sam). I think it is excellent music to blog by. But if you think I’ve gone too far in this post, do say so in comments, as it would allow me to respond that I was entitled to let my normal standards slip because I was under the influence of the music! Tony Yates believes the claim that the 2013 UK recovery vindicates austerity is “twaddle”. It is a politically motivated claim that makes no sense in terms of basic macroeconomics. Yet today we have the results of the FT’s survey of economists, which among other things asked “Has George Osborne’s “plan A” been vindicated by the recovery?”. Chris Giles and Claire Jones report that “A thin majority of 42 to 38 said the chancellor was “vindicated””. (All the FT’s questions and my replies are below.) Confused? The first point to make is that of the economists surveyed, many gave equivocal replies. For example many pointed out, quite rightly, that Plan A had been put on hold in 2012. So there is a lot of interpretation involved to get that 42/38 split. Second, only little more than a dozen of the economists surveyed were academics: there were far more city economists, plus others from organisations ranging from the Institute of Economic Affairs to the TUC. So what if we just looked at the replies from academics. Here I counted just two clear Yes responses, from Patrick Minford and Mike Wickens. There were ten clear Nos, and only a few equivocating. For the much larger number of city economists surveyed, I actually thought the split was more even: as many No as Yes replies, and a large number of neither. Yet that still means that at least a dozen city economists gave a clear Yes. So this sample clearly suggests a divide in the views of city versus academic economists. Where does this divide come from? Here are some possible answers, with some brief remarks. Sensitive city economists should look away now. (1) Academics live in ivory towers, whereas city economists work with real data in real time. (2) City economists are obsessed with short term forecasting, and so find it difficult to take a more considered, analytical view. They may also be more subject to outcome bias. (3) A few city economists may be hired more for their ability to talk rather than for their knowledge of macroeconomics. Remark: Please note the ‘A few’ in this sentence. Here is another quote: “The return of growth in 2013 … [is] an invalidation of the new [sic] Keynesian assertion that growth could not return during fiscal consolidation.” which would fail in any exam anywhere. A kinder way of making the same point would be that some city economists learnt their trade when RBC models were taken more seriously. (4) City economists are influenced by the ideology that pervades the city. That ideology says that the financial sector is invariably a force for good, and government generally a force for bad. Advocating austerity fits with that ideology, and also has the advantage of distracting attention away from what caused the recession in the first place, and the massive bail out that the city received. (5) One idea behind austerity, which is that the markets are poised to punish excessive debt, suits those who ‘are close to the market’ and can therefore interpret its moods. Here are the FT questions and my replies. 1. Economy To what extent will the UK maintain its recent pace of economic growth in 2014? Will households start to feel better off? Do not have a clue, and if they are honest neither does anyone else. Consumption, and the associated demand for credit, is the key, and we have very little evidence on this. Whether households 'feel' better off will depend on whether they are better off, which mainly depends on Q5. 2. Sustainability Is the recovery set fair, or will this upswing end in tears? Why? If by tears you mean hitting supply constraints and inflation rising as a result, I would be surprised if this happens in 2014. My instinct is that there is scope for a substantial recovery. 3. Monetary Policy Will the Bank of England change its forward guidance in the coming year? Should it? The MPC will change its forward guidance if there is a useful message it wants to get across. If at 7% unemployment there are still no signs of overheating in the labour market, they could well lower this threshold to 6.5% or less. 4. Fiscal policy Has George Osborne’s “plan A” been vindicated by the recovery in 2013 and should the planned pace of deficit reduction continue unaltered? The economy was always going to recover at some point, so how can a recovery that occurred 4 years after the recession vindicate Plan A? And then there is the fact that the data appears to show Plan A was put on hold in 2012. This is basic economics and data guys - why are you even asking the question? Perhaps you have made the mistake of reading your own newspaper's leaders! The second part of the question should therefore be: should policy revert to Plan A now that the recovery has begun? The answer is no, because another dose of austerity will slow the recovery for sure (ask the OBR, the IMF, and pretty well any academic macroeconomist.) As long as interest rates are at the zero lower bound, and there is no problem selling debt, austerity is a major mistake. In 2010 they had Greece as an excuse - what is the excuse now? 5. Labour market and productivity By the end of next year, what are we most likely to be saying about the productivity puzzle? I hope we will have some more clues about the puzzle, which is really THE issue at the moment. If the suspicions of many in the Bank and elsewhere are correct that this has a lot to do with bank lending to SMEs, we should be asking how we avoid SMEs being so dependent on a few large UK banks in the future. 6. Housing. To what extent does the housing market need to be restrained? If so, what policies might work? Yes. There are plenty of instruments (but interest rates are not one of them), but a very simple thing both the Bank and the government could do is say that - as the government intends to substantially increase the supply of housing and the MPC will raise interest rates at some point - a large decline in house prices is quite likely over the next decade. 7. Scotland How would a yes vote for independence affect the Scottish economy and the rest of the UK in 2014? On fiscal matters the negotiating position of an independent Scotland is weak, and as a result arrangements if they keep Sterling will be tough. I would not be surprised if we ended up with a new Scottish currency if Scotland votes for independence. I suspect the SNP know this, but want to avoid admitting it before the vote. As the storm force winds blew, I wondered to what extent the debates on immigration and austerity shared a common feature. In both cases economists might feel like someone trying to walk against high winds: it is hard, perhaps painful, and you seem to be getting nowhere fast. To be less metaphorical, in both cases the economic arguments seem to be irrelevant to the public debate, and the politicians want to go in the opposite direction to the one suggested by the economics. I have talked a great deal about austerity before, but not about immigration. A typical example of the economic arguments is this NIESR study by Lisenkova, Mérette and Sanchez-Martinez (pdf, blog post), which models the impact of the current UK government’s attempts to reduce net migration. (As this Bruegel post shows, the UK debate is fairly typical.) Although the paper uses an OLG model, and allows for some quite elaborate differences between migrants and natives, the basic results are intuitive. As migrants tend to be younger, reducing migration reduces GDP per capita (by about 2.5% in 2060), because there are less workers for each pensioner. For this and other reasons, migrants make less demands on the state, so a reduction in migration raises government spending per person (e.g. the elderly use the NHS more) which requires higher tax rates. One interesting result is that although restricting migration raises pre-tax wages (less labour supply), after a time post-tax wages are lower because of the higher tax rate. In short, migration is beneficial for the economy as a whole, and for households as a whole. For a short summary of other empirical evidence, see this article by Jonathan Portes, or this from the OECD. Yet the political debate presumes the opposite. It is taken as read that migration causes all kinds of harmful effects, and the debate revolves around measures to prevent these. It is summed up by this quote from BBC political journalist Nick Robinson. So you see why I think there is a potential parallel with the austerity debate. The evidence suggests that migrants make a net fiscal contribution relative to natives, just as all the evidence suggests that austerity is harmful in a liquidity trap. However the ‘public’ believe otherwise, and (by implication) economists should get real and stop going on about evidence so much. There is a difference, however. Government debt is not a ‘doorstep issue’, whereas immigration is. In 2010 the Eurozone crisis brought the issue of debt to the fore, but since then in most countries it has been the politicians and sections of the elite that have kept the debt problem alive (to justify austerity). The ‘need’ for austerity is accepted by the public because it is portrayed as governments doing what households do in bad times: tighten their belts. But I do not think excessive government debt is an issue that many politicians encounter when they go canvassing for votes, but migration certainly is. Equally I doubt that the current UK government would have made migration such a big issue if it wasn’t perceived as a vote winner, and if it was not for UKIP. Does this make a difference to how economists react in each case? We plug away at the economics of course, but how do we explain why the economics seems to be ignored? With austerity most explanations involve thinking about how politicians and sections of the elite think: why they may be irrationally worried about market panics, or why debt may be a cover for other agendas. With migration the focus has to be about why large sections of the electorate believe that migration harms them. I see three strands of thought here, although none are mutually exclusive. The first is to acknowledge that there is a natural tendency for communities to be concerned about outsiders, but blames the media and some politicians for playing on this concern. This can explain why popular concern about immigration can be so high in areas where there is very little. The second is to grant that migration may be beneficial for the economy as a whole, but acknowledge that for some the immediate (and therefore personally verifiable) impact is negative (e.g. less unskilled vacancies, lower wages, higher rents). This article by John Harris exemplifies this strand. A third takes the concern about outsiders more seriously, and talks about the benefits and costs of social diversity. A second difference involves politics. To the extent that austerity is a cover for sections of the elite to push for a smaller state, then austerity morphs into a standard debate between right and left. This helps explain why what on the surface should be a technical macroeconomic discussion about multipliers and the effectiveness of unconventional monetary policy is in reality so politically polarised. This is not the case with migration. As this letter from members of various UK right wing think tanks indicates, restricting migration runs counter to the neoliberal agenda. Others argue that public concern about migration reflects the failure of the left to oppose (or worse, pursue) this agenda. Perhaps I can sum things up this way. While I find the macroeconomics of austerity interesting (it’s my field), I believe the reasons why the economics is ignored are fairly straightforward and much less interesting. In the case of migration, I think understanding why the economics is ignored is much more of an intellectual challenge. Many thanks to Alex Marsh for saying nice things about this blog, but Chris Dillow absolutely deserves the No.1 spot. To see why, read this. I would have loved to have thought of this counterfactual, but whereas I would have ended with something predictable on the economics or politics, Chris talks about the importance of luck. Brilliant!